This is where my bathtub used to be. 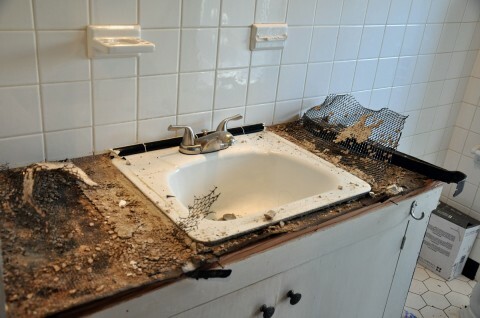 In fact, there used to be a wall, a toilet, a sink and other such bathroom necessities. 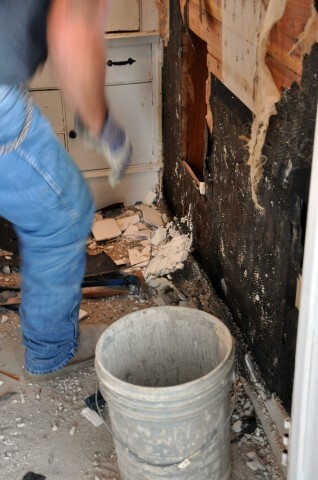 The demolition has begun for our vintage bathroom renovation. After two days and too much noise, everything was taken out. The floor tiles and the countertop tiles had all been installed in a thick layer of concrete over metal mesh, which was the norm until the late 1950′s when thin set mortar was invented. The walls were covered with white tile wainscoting and removing the tile revealed a layer of tar paper, a layer of cheesecloth for the original 1920′s wallpaper, and then the final foundation of shiplap wood. For the demo, the workers broke everything up into small pieces and carried it downstairs in 5 gallon buckets (many, many trips down the stairs and to the dumpster). The bathroom is next to a small bedroom or sitting room, so we are expanding the bathroom into that space and creating a connected dressing room. While removing some drywall in that room, we found this strip of very old wallpaper with a Roman style scene that includes fish and chariots and ancient symbols. We were told by the previous owners that this eccentric wallpaper was discovered in many other rooms, which is difficult to imagine. Our contractor, Roger Wood, and his crew were very careful during every stage of demolition considering the age of our house. 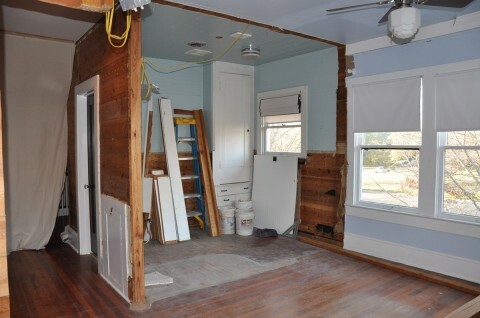 They saved all the original, seasoned shiplap wood that was removed so that we can use it to patch up other walls. 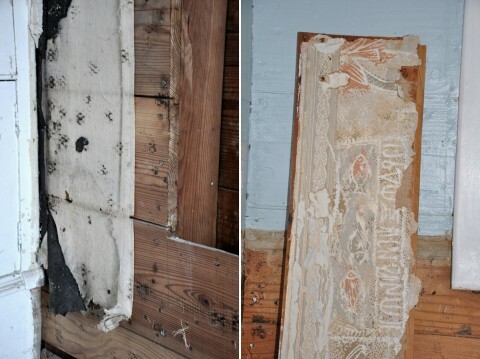 They preserved any stray bits of wallpaper and any original hardware, as well. Despite the mess during the unraveling of my bathroom, they left the room neat as a pin at the end of every day. 1. 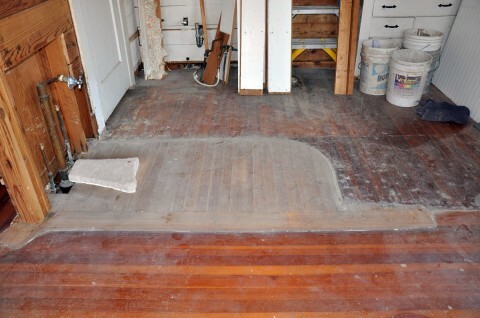 Tape down heavy canvas drop cloths on all floors leading through the house to the demo zone. Cover vents with plastic so that sawdust will not float into the duct work. 2. Clearly mark any items that should not be torn out. For example, I used masking tape and a marker to label a linen cabinet as a “keeper”. Let there be no question what stays and what goes. 3. 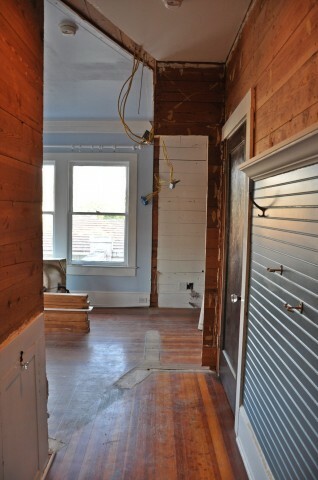 Save all hardware and fixtures, especially in an old house, until the project is complete. Re-purpose what you can and take anything usable to Habitat for Humanity. Some of those old fixtures could be vintage and worth a few bucks on the re-sale market.